We’re still waiting to hear from specific companies like Amazon with their latest (non-)numbers on how well their Kindle line of devices has sold over this holiday period, and from the various analysts that track overall device sales and shipments (but we’ve had a few indications that sales will be strong). 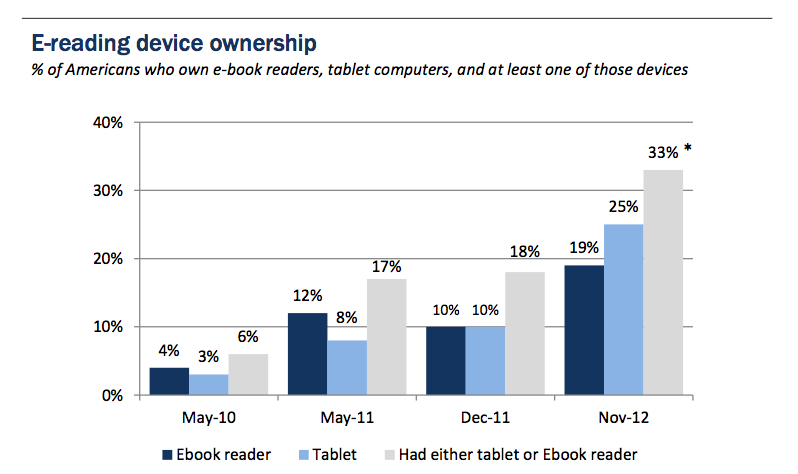 But in the meantime, some research out today from the Pew Research Center on e-reading sheds some light on how the key U.S. market appears to be moving: specifically, ownership of tablets like the iPad has overtaken ownership of e-reading devices like the Kindle, with the number of people using both continuing to rise. According to Pew’s ongoing Internet & American Life survey, 25% of respondents — one in every four — now owns a tablet; while e-reader ownership is now at 19%. Biggest of all is the fact that now one in every three people owns some kind of device — tablet, e-reader or both — for e-reading. That’s more than a twofold rise for tablets over December 2011, when tablets and e-readers were level, with 10% of surveyed respondents said they owned one or the other. This most recent survey dates from November 2012 — meaning that the proportion is likely to rise even further after holiday sales shopping is taken into account. Lee Rainie, director of the Pew Research Center’s Internet & American Life Project, said that the survey didn’t measure which devices were leading the charge for tablets and e-readers, but figures from Strategy Analytics in October noted that Apple’s iPad, as of last quarter, was still leading the pack, although its lead was narrowing considerably as Android device makers, from Amazon to Samsung, continued to pick up more users. Unsurprisingly, the rise in tablet and e-reader ownership, Pew says, has had a direct impact on how many people are turning to e-books rather than printed books when it comes to reading. They now stand at 23% of the population aged 16 and older — nearly an identical proportion to the number of people who say they now own either a tablet or e-reading device. A year ago, Pew said that the proportion was 16%. We are not yet at a tipping point for reading, however. Reading printed books continues to decline, but it still remains well ahead of e-reading: the percentage that said they read printed books now stands at 67%, down from 72% a year ago. For now, it seems like e-reading remains a more affluent pursuit. Pew’s research found that the highest percentage of consumers reading at least one e-book over the last year, 44%, is among those whose household income is at $75,000 or higher — and the numbers decline steadily with each lower income bracket. People aged 30-49 were the most e-reading friendly, with 41% of all respondents in that age range also saying they’d read at least one e-book over that period. Rainie tells me that the e-reading trend may become more democratized as cheaper devices continue to enter the market, an area led by Amazon and its Kindle Fire range but also complemented by other OEMs developing both Android and Windows 8 devices to compete against the premium-priced iPad from Apple.